Bruges Bed and Breakfast in Bruges - Bed and Breakfast and apartment "Azalea" in Brugge. Luxury b&b with jacuzzi, dishwasher in Bruges. 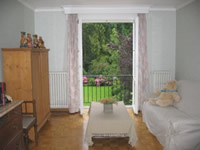 Azalea Bed & Breakfast provides a wonderful place for you to stay whilst you visit the delights of Bruges. 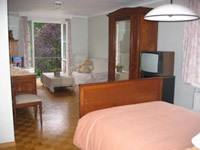 We offer you a superb Family Suite: a very spacious double room with sitting area, overlooking the garden. 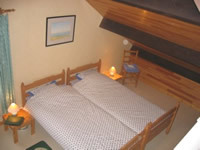 The adjacent room has two single (bunk)beds and sitting area. It is also possible to rent one room. When the weather is fine, the lovely garden is available at all times for guests use. 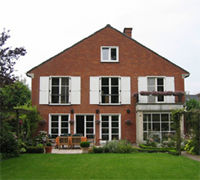 It is situated in a residential neighbourhood just one mile outside Bruges railway station and historic centre. Although extremely quiet  it borders a peaceful park  the bed & breakfast provides easy access to the motorway and is easy to find when you come from the motorway. You want to stay in Bruges for professional reasons or to visit the beautiful city of Bruges? Notice that from Bruges all Belgium is at your fingertips, and even so the most interesting towns in France, the Netherlands and Germany.